How to add text to a GIF with Movavi Video Editor? Want to know how to add text to a GIF? Ever wondered how people get to edit GIF online? Better still, how to add breathtaking GIF effects to GIFs? You'll get all your answers in a bit! Before now, communications were based solely on texting with alphabets or sending static pictures. As the society progressed, along came smileys and emojis, but fast forward to today and GIF is the order of the day! Graphics Interchange Format well known as GIF has become the internet's favorite format for breaking news online, telling jokes and even stories. It gives web users new ways to express certain emotions that may not be well represented using emoticons. GIFs add special effects to an image – simply put, making it more like a mini video without sound, that can be watched from start to finish in as little as one or two seconds, following a simple fashion that loops over and over. Getting around how to edit a GIF may be somewhat a daunting task. No doubt – GIFs are always fun to share online as they bring in tons of cool fun moments of laughter and happiness. What's more fun is a lot of persons love to play around with GIFs, adding more GIF effects, combining images, adding funny text and modifying filters to make their GIFs look great whilst relaying the intended message. However, in editing a GIF, it all boils down to what you want to create – all you need is a GIF editing tool. The first thing to do is find the GIF you want to edit, import the selected GIF, GIF animation or just about any image you want to use onto the tool and then carry on with your edits. If it is a few seconds of a video you would like to convert into a GIF, same process applies – import the video unto the editing tool and depending on the type of tool you are using for the edit, you can crop the part you want to use for the GIF on the GIF editing tool, convert the file to GIF format and then carry on with the application of other effects. It doesn't end there – There are quite a number of GIF editing tools that come with features that allow you to edit your GIF online, producing great results – Wanna know? Just hang in there a bit. It is no news that people like to work all manner of effects on a GIF to convey different messages. However, not everyone knows how to edit a GIF or how to add text to a GIF and chances are you just might be one of them. This is an online based GIF editing tool that has quite a number of fascinating features that help users up their game of creativity. The best part of this tool is that it is readily accessible to anyone online without going through rigorous processes. It is quite easy to manipulate and modify GIFs as it allows users to optimize, crop or resize and create impressive GIF effect. Users can also put text in their animated GIF with the GIF text editor, change the speed of the animation as per user requirements. EzGIF.com does a fine job in creating the GIF you need, however, it may not be as refined and powerful as other GIF editing tools owing to its basic features – asides being less powerful than other tools, it definitely works well to deliver good results. 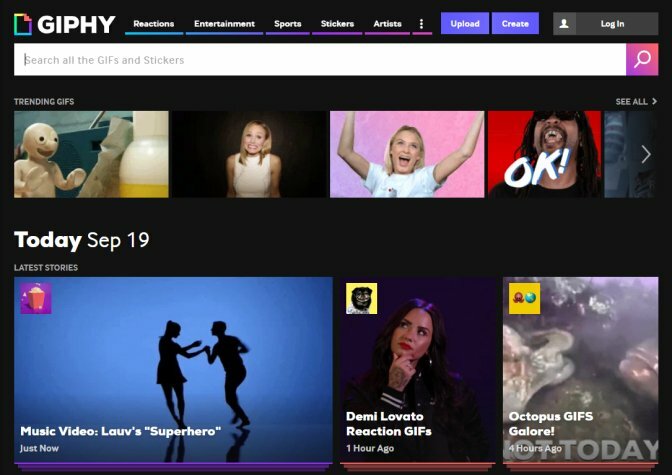 Giphy.com is your go-to option if what you need is some of the best-animated stickers and filters online to help modify and create your dream GIF. It is a very simple and easy to navigate tool and it offers a good value for sure, in fact, comes in quite handy for any type of edit you want to make on your GIF. The steps are quite easy – first off is to drag the GIF you want to edit unto the GIF Editor screen, you can start adding stickers, put text with the "Caption tool", add filters and then animate it if you like. That’s all it takes to get that one-of-a-kind GIF. Animizer.net is a top of the line GIF editing tool. The tool is set to work with animated GIFs, animated PNG images and it adopts an approach focused on efficiency and outstanding results. It is also very easy to navigate, quite standard and professional offering some great options and stellar outcomes. The minor complaints from users are that you can't access the editor directly, as you are required to first upload your images. Animizer.net also allows more advanced editing on images such as splitting animated images, converting images to different formats, assembling static images or animated images into one GIF, adding text to an animation or static GIF. GIFs can go from that boring point of zero to a hundred real quick in few seconds – wonder how? It’s quite easy; you can achieve by merely manipulating and editing to create impeccable visuals. With that in mind, and also seeing some of the best free online tools (the above-mentioned) at your disposal, you can give them a shot. However – while these tools may prove reliable, efficient and cost-effective, they may not be able to exactly provide you with the value you want as you may not have much control over the final product – they’re fine if you just need a simple, quick fix and nothing out-of-the-box. 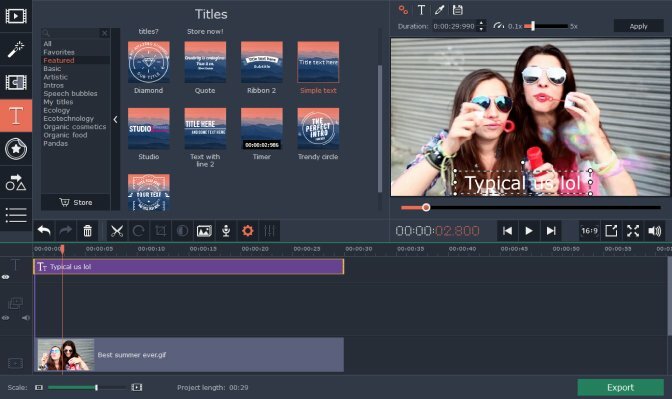 Here's one tool you might want to consider – Movavi Video Editor is a super easy-to-use video editor that enables you to add text to your GIF, overlays, beautiful filters, animate your GIF, convert to different formats with ease. GIF editing can go from slowing down your GIF to speeding up, cropping and resizing, splitting and combining GIFs to adding customized fonts of different sizes with their GIF text editor. Movavi Video Editor presents an all in one tool that gives users the best GIF effect. Launch the program, click Create a project in full-feature mode. Upload your GIF to the program via Add Media Files button. Click the Titles tab, select the type of caption you like, and drag it to the Titles Track on the timeline. Edit the text of your titles. Export the file in GIF format.